Did you know that according to the National Trust for Historic Preservation (as reported in a recent article by Ruth Graham in the Boston Globe), there are more historic house museums in this country – over 15,000 – than McDonald’s restaurants? 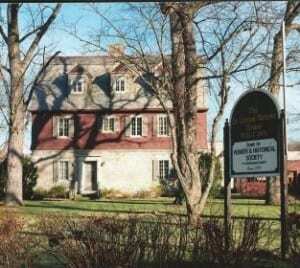 Dr. Increase Matthews House, Zanesville, Ohio. Courtesy of Pioneer & Historical Society of Muskingum County. Are There Too Many House Museums? 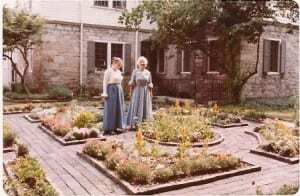 Garden tour of the Matthews House, 1970s. Courtesy of Pioneer & Historical Society of Muskingum County. From an historic preservation standpoint, the Pioneer & Historical Society of Muskingum County’s Dr. Increase Mathews House in Zanesville is in good physical shape. The challenge: How does the museum regain the significance enjoyed when it opened in the 1970s? If the Mathews House continues to operate as it always has – guided tours, antiques on display, look-but-don’t-touch mentality, etc. – the result will likely be a continued decline in visitors, increased irrelevancy and a decline in financial stability. Operating a house museum in Zanesville in 2014 and beyond has some obvious problems, including competition from other museums. Short trips to Newark, Lancaster and Columbus provide visitors with modern, state-of-the-art, high tech, hands-on, relevant museum experiences. A variety of cultural, entertainment and recreational activities offer local residents many options when choosing leisure-time activities. Social media and the internet offer more immediate sources of information. Figuring out how to attract more visitors is essential to regaining the stature and importance enjoyed in the 1970s. Garden tour at Matthews House, June 2014. Courtesy of Pioneer & Historical Society of Muskingum County. The Boston Globe article suggests that because most people just don’t have much interest in history, the solution has to include creative programming that taps into people’s interests. 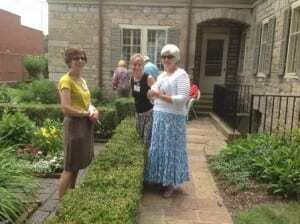 On June 22 of this year, over 300 people interested in gardening visited the Mathews House. Most were visiting for the first time. They came to see the gardens and grounds as part of the Beaux Art Club Garden Tour, but many also toured the museum and learned a little local history in the process. This event was a great example of creative programming at work. How is your museum working to attract visitors and combat irrelevancy? Please share your take on the article or stories of how creative programing has helped generate interest in your site in the comments section below. In 2012 the number of students obtaining bachelor degrees in history surpassed 35,000 for the first time on record according to the AHA. How does this author at the Boston Globe (which operates in a city with a booming history industry) deduce that people “just don’t have that much interest in history”? There are many ways we can be more vibrant however, the nice part about having a historical home is that it has stood through every aspect of life in your locality. If you have a garden club it was there when it was conceived, in a big cycling community it may have seen the invention of the bicycle, and so did the people that lived in the home. When we broaden our idea of what a historical property touches we can find new audiences that have just as much interest in history as our core membership.